I am in a paper doll mood! I must be in a wooden block kind of mood, too. 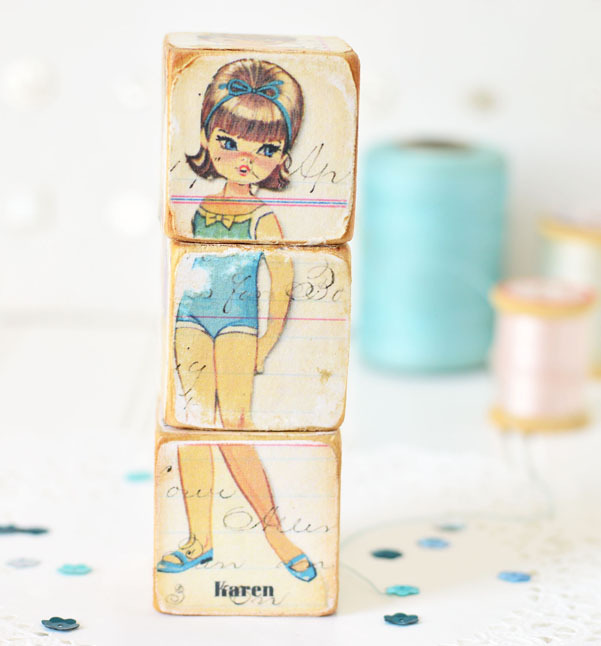 Did you see the other paper doll block? 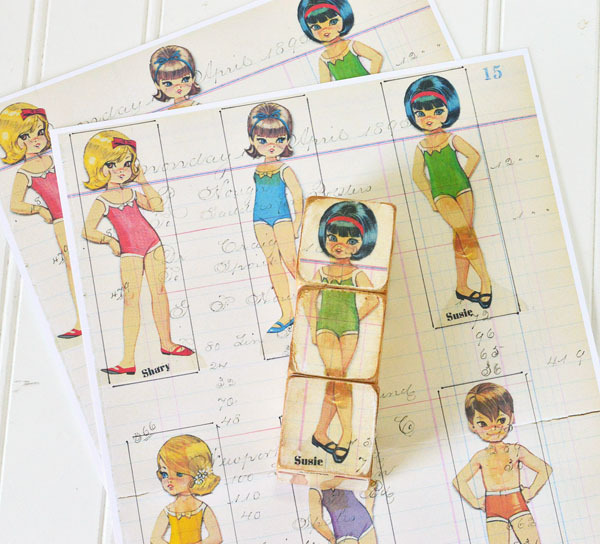 My great aunt Jane found these Sixties (I think) paper dolls for my mom quite some time ago. They are ADORABLE! You'll notice this one is named Karen - that's my mom's name, too! I keep this set of blocks on my desk in the summer. I think they look like they're wearing swimsuits. They make me smile every time I see them. I change the little cuties around every once in awhile, so I see a different one. I've got these paper dolls all ready to be printed. 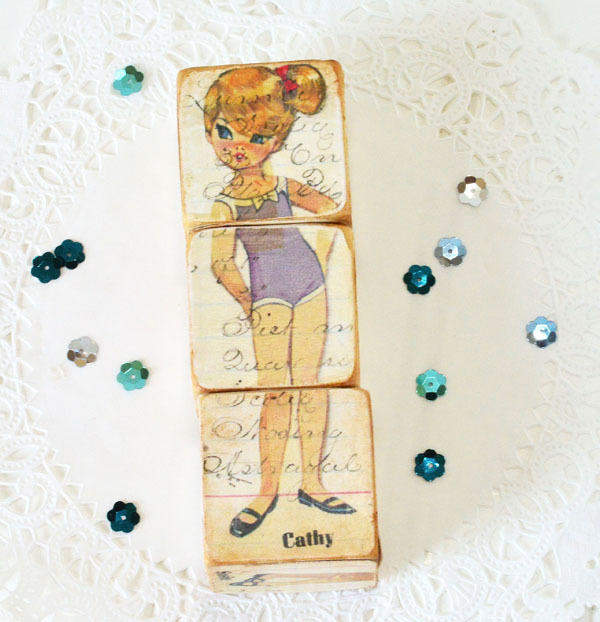 They are on a beautiful vintage ledger sheet which really adds character to the blocks. You can download them either with or without the cut lines. The cut lines are there so you don't have to figure out where the center is on each doll. Just cut right inside the lines. My blocks are 1 1/2", but you could use a different size. You would just need to print the paper dolls the size of your blocks. I explain a little better how to do that in the video below. You need just a few supplies. First, download the paper dolls. Download the Paper Dolls (with no frame) HERE. Download the Paper Dolls (with cut frames) HERE. Next, gather wooden blocks, glue, sandpaper, distress ink, and modge podge. Tomorrow when I get to work, I'll change my blocks around - I think it might be Susie's turn! I got the email on this. Read it. Passed out and then came to and now I'm here to leave some love. This is vintage AWESOME!! I loooove how fabulous this idea is. You've knocked this out of the park. These are adorable, Lori! Thanks for the great video tutorial! And the free paper dolls! Thank you for the freebies AND for the idea! Great memories here. What cuties Lori and such a fun idea. Thank you for sharing. Beautiful creation made here Lori, these cuties are adorable and fabulous colours used, love the whole concept of this creation...thanks for the freebie and video. You have knocked my socks off with this post Lori!! You have the sweetest images and I think you must be one of the sweetest bloggers I know. This is a fantastic idea. I really want to make me some of these blocks!!!!! Wow sugar! Thank you for sharing.These are adorable, Lori!